Google is about making things accessible to everyone and one of the way to make this happen is to buy a service or software that used to cost money and release it for free. Google did this with Blogger PRO, Picasa, Keyhole (now Google Earth), Urchin (now Google Analytics), SketchUp and now FeedBurner PRO. According to UnderGoogle, the first visible effect of the FeedBurner acquisition is that you can use the advanced features of FeedBurner for free: reach (the unique number of people who view or click your feed posts) and stats for individual posts. Just go to "FeedBurner stats" and enable the features that used to be inaccessible until today if you didn't want to pay $5 a month for a subscription. By default, FeedBurner already enabled the reach metrics for everyone. "Reach is the total number of people who have taken action — viewed or clicked — on the content in your feed. Subscribers is a measure of how many people are subscribed to your feed. At any given time, you can expect that a certain percentage of this subscriber base is actively engaging with your content and this "Reach" measurement provides this additional insight." And other good news: FeedBurner MyBrand, the service that lets you serve your feeds from your domain, is now free. It used to cost $3-$14/month, depending on the number of feeds from your account. "With MyBrand, publishers can continue to take advantage of all of FeedBurner's services, but provide a transparent experience by running everything through their domain." Update: FeedBurned confirms this. "Beginning today, two of FeedBurner's previously for-pay services, TotalStats and MyBrand, will be free. Not in the sense of soaring high above the clouds or recently sprung from the hoosegow, but free like you'll no longer gladly be billed on Tuesday for a burned feed today. We suspect this will be welcome news to the 450,000+ of you using many of our other free services, but understanding that your feed is your feed, you will need to activate these newly freed-up services in order to partake in their awesomeness." 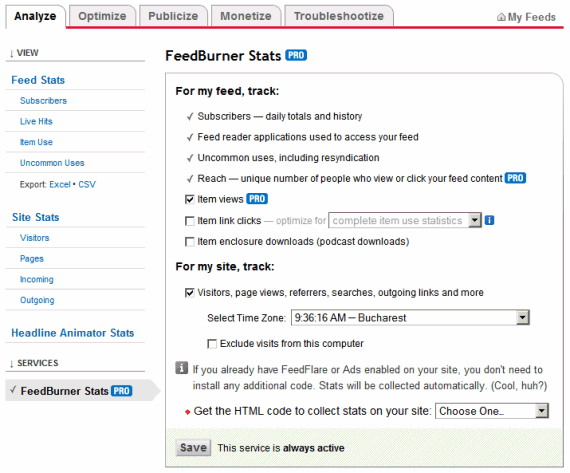 My Account / PRO Payment Info says "FeedBurner Stats PRO • $4.99/month • 15 Day Trial (15 days remaining)". So I guess it's just a trial. Yes, Chris, you are absolutely right. I edited the post. In the Google China Office，can not visit Blogspot directly. I think you have a misleading post title. This news a bit early mate? Why is the title misleading? FeedBurner MyBrand used to cost money (here's the cache of a FeedBurner page) and now it's free (here's the same page as it looks today). This change comes after FeedBurner was bought by Google and we can safely assume it's connected to the acquisition. You forgot to mention Google Analytics/Urichin in the list of goodies that have become freely available. I'm glad that FeedBurner cleared the confusion. Starting today, both services are free, so you can get more advanced stats and a feed that doesn't start with feeds.feedburner.com. I hope they'll integrate this feedburner stuff soon with Blogger. It is fantastic that feedburner is still free today it is a valuable resource for all bloggers to take advantage of.